Examples, solutions, videos, worksheets, and activities to help students learn about how to graph rational functions. f(x) = p(x)/q(x) where p(x) and q(x) are polynomials and q(x) ≠ 0. How to graph rational functions? 2. vertical asymptote occurs at the x value that makes the denominator = 0. 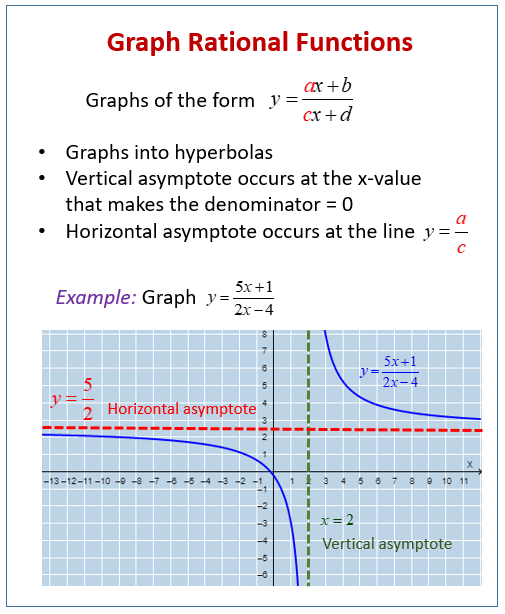 3. horizontal asymptote occurs at the line y = a/c. The following diagram shows how to graph rational functions of the form y = (ax + b)/(cx + d). Scroll down the page for more examples and solutions on how to graph rational functions. A couple of examples on graphing rational functions.